Centenary Farmers’ Market is where most of the locals gather on the banks of the river every weekend. Villagers from the nearby valley come here to sell agricultural products and handmade crafts. Welcome to Bhutan and your first day in the magical Land of the Thunder Dragon! Upon arrival at Paro International Airport, just outside the arrival hall, you will be greeted by one of our guides. At more than 7,300 feet above sea level, you will need to acclimate to the high altitude. So, we will take it easy with a short drive to your hotel, enjoy a Bhutanese lunch, and then visit a few sights around the capital city of Thimphu. We start our tour at Motithang Takin Preserve, home to Bhutan’s national animal, the takin. This unusual animal is often described as looking like a moose that was stung by a bee. Formerly a small zoo, the king decreed that penning up animals was contrary to Buddhist beliefs, so they were released. The takin had difficulty adapting, so the preserve was established to care for these gentle creatures. We will then drive up to Buddha View Point where the Buddha Dordenma statue sits. At 169 feet tall, this bronze statue can be seen from just about anywhere in Thimphu. One of the largest statues in the world depicting a seated Buddha, it is the perfect place to enjoy stunning, panoramic views of the city. Today we visit the National Folk Heritage Museum, dedicated to connecting Bhutan to its past with exhibitions, demonstrations, and artifacts. Designed to resemble a rural home, this 19th-century building houses three stories of art, culture, and relics. At The National Textile Museum, you will witness the art of weaving and learn about the significance of textile design. Bhutanese weaving is considered a living art form and traditional weaving methods are preserved by the Royal Government. The National Memorial Chorten was built in 1974 to honor the late King Jigme Dorji Wangchuck. A chorten is a hemispherical shaped memorial stupa. 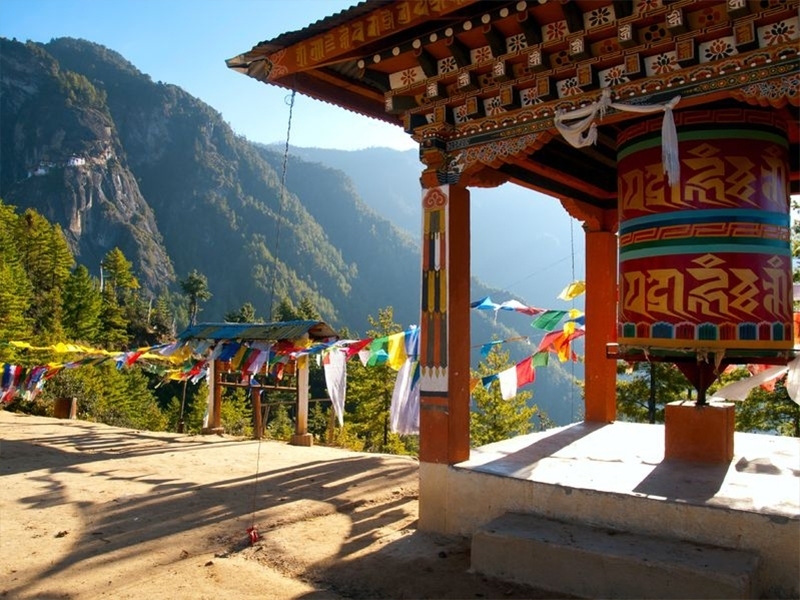 Known as the most visible religious landmark in Bhutan, it is used as a place of meditation. Outside Thimphu is Simtokha Dzong, the oldest fortress in Bhutan. Legend says it was built to imprison a demon that was terrorizing the area. The first fortress of its kind, it features beautiful Buddhist paintings and carvings. Thimphu Tashichho Dzong, a traditional fortress and Buddhist Monastery, is the largest in the city. Featuring distinctive Bhutanese architecture, using neither nails nor written plans, the structure serves as the current seat of the King of Bhutan. On our way to Punakha, the former capital of Bhutan, we will stop at Dochula Pass. Providing stunning 360-degree views of the Himalayan Mountains, it is also the location of the 108 Druk Wangyal Chortens. Ashi Dorji Wangmo Wangchuck, the present Queen Mother of Bhutan, built the memorial to commemorate Bhutan’s victory over Indian militants and to liberate the souls of those who died. Sitting at the fork of two rivers, Punakha Dzong is considered one of the most beautiful spots in Bhutan. With spectacular displays of Bhutanese architecture, it stands like a medieval city surrounded by lavender Jacaranda trees. Built in 1637, the six-story structure is the second oldest and second largest dzong in Bhutan. It still serves as the winter home of the Je Khenpo, Chief Abbott of the clergy. In 2011, it hosted the royal wedding of King Jigme Khesar Namgyel Wangchuck and Queen Jetsun Pema. Khamsum Yulley Namgyal Chorten is a one-of-a-kind example of Bhutanese art and architecture, built by the third Queen Mother, Ashi Tshering Yangdon Wangchuck. This beautifully designed chorten took nine years to build, using only religious scriptures to construct the four-story temple. Accessible only by foot, the one-hour walk crosses over a suspended footbridge that is adorned with colorful prayer flags. We head back to scenic Paro Valley, home to many of Bhutan’s oldest monasteries and the country’s only airport. This mixture of old and new makes Paro an important part of Bhutan’s past, present, and future. The valley is home to Chomolhari (Jomolhari) Mountain, located on the northwestern border of Bhutan and Tibet. Often called the wife of Kangchenjunga, the world’s third highest mountain, Chomolhari is Bhutan’s third tallest mountain at 24,035 feet. The glacier waters flowing from the mountain feed the rivers of the Paro Valley. Paro (Rinpung) Dzong means Fortress on Jewels because it was built using stones rather than clay. It is an excellent example of 15th-century architecture and one of the most impressive dzong in Bhutan. It currently serves as the government center of Paro. A cantilever bridge that crossed the river was damaged by fire in 1907 and later washed away by floods, so the original construction was lost. Located on a hill above Para Dzong is Ta Dzong. This cylindrical watchtower was built in 1649 and converted into the National Museum of Bhutan in 1968. The spiral-shaped building holds antiques, art, textiles, weapons, and household items that tell the history of Bhutan. We will take a two-hour hike to Taktsang Monastery, arguably one of the most photographed monasteries in Bhutan. Accessible only by foot, this sacred site was built precariously on the cliff’s edge, more than 10,000 feet above sea level. This is where Guru (Rinpoche) Padmasambhava, the father of Bhutan Buddhism, is said to have flown on the back of a tiger to meditate in a cave for three years. An exhilarating climb to the cafeteria is decorated with colorful prayer flags and provides breathtaking views of the Himalayas. A short drive away is the ruins of Drukgyal Dzong. The great Zhabdrung Ngawang Namgyal built this fortress in 1647 to fight invading Tibetan armies. In 1957, a fire destroyed the dzong, but it was left in ruins as a reminder of Bhutan’s glorious past military victories. On clear days, the snow-capped peak of Chomolohari Mountain can be seen. We end our tour with a visit to Kyichu Lhakhang, one of the oldest Buddhist temples in Bhutan. This is the second of two temples built in Bhutan by Tibetan King Songtsen Gambo in a single day to hold down the giant demoness who was preventing the spread of Buddhism. We bid fond farewell to this beautiful Himalayan country And we look forward to seeing you again in this beautiful land of endless Enchantments! Tashi Delek. Bhutan Royalties, tourists fees, Visa fees, museum/monument fees and taxes. All meals(Breakfast, Lunch and Dinner)including evening tea/coffee etc through-out the tour in Bhutan. All land transfers, sightseeing with entrance fees. Experienced English Speaking Bhutanese Tour Guide. Bottled water in the vehicle and other comp. services. Personal expenses such as bars, beverages in the hotel, telephone, laundry, tips, and others. 50% discount on daily rates to one person in a group of 11 to 15 people. 100% discount to one member in a group exceeding 26 persons. Copyright © 2019 AmeDewa Bhutan All Rights Reserved.